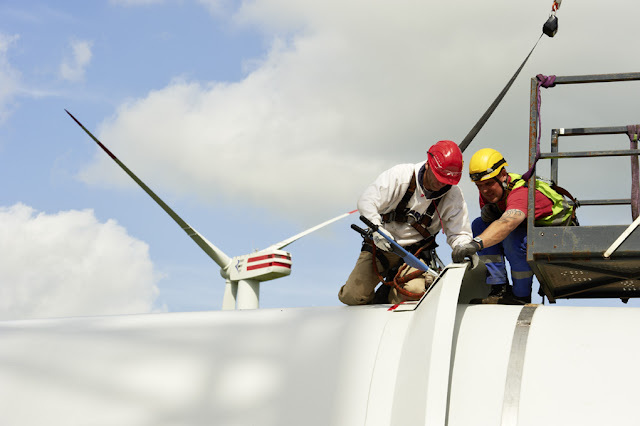 REpower UK, the Suzlon Group’s UK subsidiary has received two new orders with a total capacity 16.4 MW. REpower will supply MM82 and MM92 wind turbines for Wear Point wind farm located in Pembrokeshire, South Wales and the Avonmouth wind farm, located in south west England. The Wear Point wind farm, which is jointly owned by John Laing (link) and major wind farm developer Infinergy (link), will utilize four MM82 turbines. The Project is expected to start Construction by summer 2013 and will be online by end of this year. The Avonmouth Wind Farm, which is jointly developed by Triodos Renewables Plc (link) and GENeco (link) will Utilize four MM92 turbines. They will be part of a renewable energy mix of wind and anaerobic digestion which is already in operation at the site. The Project is expected to start Construction by summer 2013 and will be online by end of this year. Both Wear Point and Avonmouth wind farms will produce enough Power to Cater 5,000 Average UK Homes. “I am delighted to announce the closure of both of these contracts. 2012 was one of our most successful years to date with nearly 300 MW signed, and these two new contracts represent the perfect start to what we believe will be a very successful 2013. We are pleased to continue our relationship with Triodos Renewables Plc for their Avonmouth Wind Farm, as well as John Laing and Infinergy for the Weir Point development in South Wales – we look forward to building on these relationships through 2013 and beyond.” Rick Eggleston, Managing Director, REpower UK said.